Prairie Spirits distills gin, vodka, and cucumber vodka. Their motto “made with respect,” explains their organic farming and distilling policies, and unusually, their liquor doesn’t cost a fortune in the light of these higher standards (a bottle will only run you $20). 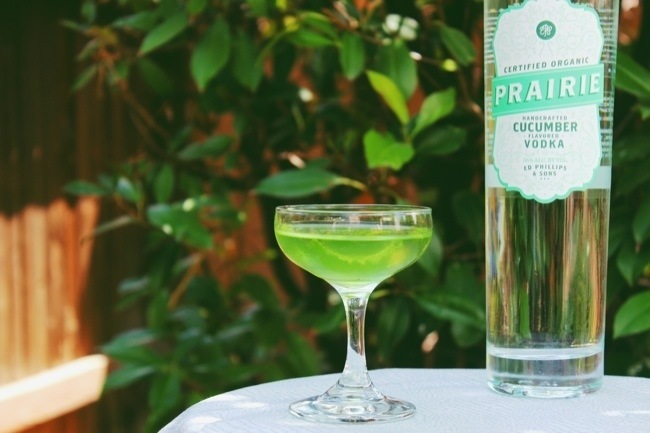 Prairie’s Cucumber Vodka is a touch sweet, and like I found with Cathead Honeysuckle, it’s a pleasant, natural, subtle flavor that’s very easily enjoyed on the rocks. Here’s a really refreshing simple cocktail you can make with cucumber vodka, (if you’re not able to find Prairie, just infuse your own). This entry was posted in recipes, vodka and tagged cucumber mint melon cocktail, Cucumber vodka, green garden, green garden cocktail, prairie cucumber vodka, prairie vodka on September 23, 2013 by Greg. This entry was posted in recipes, whiskey and tagged cocktails with maple syrup, maple old fashioned, Old fashioned, old fashioned cocktail on September 19, 2013 by Greg. I came across this recipe recently for a not-too-complex tiki drink. As I was getting ready to photograph it, though, I found some awesome vintage glassware at a local thrift shop that is made specifically for this cocktail and I knew I had to show it off. This entry was posted in recipes, rum, tiki and tagged Planters punch, simple tiki drink, tiki cocktail, tiki drink, tiki glassware, vintage cocktail glasses on September 10, 2013 by Greg. Grenadine is probably the second home bar syrup you’ll get, right after you make some simple syrup. Wikipedia says Grenadine is “a commonly used bar syrup, characterized by a flavor that is both tart and sweet, and a deep red color…..Grenadine was originally prepared from pomegranate juice, sugar, and water.” As you can see, this can cause some confusion: does grenadine contain pomegranate? Not always. In fact, many popular brands have no pomegranate at all, which you’ll see below. You may recall when I tried Jack Rudy tonic too, which is great. This grenadine, like Sonoma, actually tastes like pomegranate. This syrup is sweeter than Sonoma, but natural ingredients lead to a different colored drink than some may expect, leaving Shirley Temples more copper-colored than red as a result. This one has good balance and isn’t overly sweet. I like Monin’s syrup the best of these 5, because it’s a happy medium of the traditional (syrupy, red, sweet) and the craft grenadines (more fruity in flavor, less sweet, less red). Plus, because the Monin bottle is so big (750 ml), the cost per ounce is very low. Rose’s is the iconic brand of bar grenadine, and you’ll be able to find it in grocery stores nationally. As you can see, it has the dreaded HFCS in it as ingredient #1. There’s no pomegranate in it, it’s really just a sticky, syrupy red and features water as the only natural ingredient. Cost is the only advantage here – Rose’s tastes like snow cone flavoring. Click here to get the Simple Cocktails Guide to Grenadine as a downloadable PDF. This entry was posted in reviews, tools and tagged cocktail grenadine, fee bros american beauty grenadine, fee bros grenadine, grenadine, jack rudy grenadine, monin grenadine, roses grenadine, sonoma syrup grenadine on September 5, 2013 by Greg. The Coffee Cocktail is a classic recipe, traced back to Jerry Thomas’ 1887 Bartender’s Guide (Amazon link). Thomas’ original recipe appears above, and thankfully, The Cocktail Spirit has translated the old-timey language (“pony,” “goblet,” etc) into modern measurements. Special thanks to St. Clair, a local winery who provided me with their excellent Port for this recipe. This entry was posted in brandy, recipes, wine and tagged brandy cocktail, brandy port cocktail, classic cocktail, coffee cocktail, jerry thomas cocktail, port cocktail on August 29, 2013 by Greg. Here’s a simple recipe for the Breakfast Martini, invented in 2000 and the most famous marmalade cocktail. This entry was posted in gin, recipes and tagged breakfast martini, gin lemon, marmalade cocktail, orange marmalade cocktail, triple sec cocktail on August 26, 2013 by Greg. You may have seen this electric green liqueur on the shelves at your local liquor store: Agwa de Bolivia. AGWA is a coca leaf liqueur, y’know coca, like cocaine? AGWA capitalizes on the fact that it’s got coca in it, that it’s distilled in Amsterdam, and it’s just so eye-catching. But legitimately, it’s a decent herbal liqueur, and while herbal liqueurs can range pretty broadly from Jagermeiser to Zwack to Fernet Branca, AGWA is unique from these three in that it’s flavor is balanced and cool, and it’s not so syrupy or abrasive. This entry was posted in liqueur, recipes and tagged agwa de bolivia, agwa de bolivia cocktail, coca leaf liqueur, coca leaf liquor, coca liqueur on August 22, 2013 by Greg.